Was this whole production a ruse? Players playing players playing a play rather than the play itself? Shakespeare’s Globe Theatre on Tour, Folger Theatre, Washington, D.C.
King Lear (Joseph Marcell) gets angry as the Fool (Bethan Cullinane) watches in the Shakespeare's Globe touring production of King Lear, which opened its North American tour at the Folger Theatre. Photo by Ellie Kurttz, Shakespeare's Globe. As the Shakespeare's Globe touring troupe performs a song before launching into William Shakespeare's King Lear, they take turns drawing with a piece of chalk an outline of England on the floor of the stage. Then, they draw two lines across this map, indicating the portions of territory the king will appropriate to his three daughters. Scoot ahead to the play's end, as the dead Cordelia lies in the dead Lear's arms on the floor. The other players, singing a Celtic-toned dirge, chalk out an outline of the king and his daughter, and as the two actors (Bethan Cullinane as Cordelia and Joseph Marcell as Lear) get up to join the rest in song, they pause and, together, trace their chalk outlines with their fingers until they join hands. It's an apt visual allegory. The play is a crime scene in which not only Lear and Cordelia but England itself is a victim. Yet, Lear and Cordelia contribute to their own catastrophic ends through missteps in social acuity, and their personal tragedies are a part of a society's degeneration in which mental impairments and personality disorders cause fewer consequences than pride and choices in this eight-actor production, which first played at Shakespeare's Globe in London last year and opened the North American leg of its tour at The Folger in Washington, D.C. It follows in the footsteps, literally and figuratively, of the Shakespeare's Globe touring production of Hamlet two years ago. This King Lear, directed by Bill Buckhurst, uses the same number of actors and the same style of set and costuming as its predecessor Hamlet, which was directed by Buckhurst and the Globe's artistic director, Dominic Dromgoole. Designer Jonathan Fensom dresses the actors in mid-20th century British countryside clothes and puts them in a space that looks like the interior of a village hall: a wall, with an entrance in the middle, has hooks for hanging various cloaks, coats, and capes, and shelves on which are placed hats, books, tankards, a tambourine and other percussion instruments. In front an old curtain hangs on a rope line, similar to what kids might use for a proscenium arch in their backyard. As the audience enters the Folger Theatre, the actors mill around on stage and talk to people in the stalls; a couple of cast members even walk up to the balcony to greet us airlings there. The impression is that of an acting company touring post-war England, giving a modern sense of how Shakespeare's company might have played the provinces 400 years ago. The house lights remain on throughout the play, and without fuss the actors switch from character to character by changing their cloaks or hats. In addition to playing songs at the start and conclusion of the play and musical interludes between some scenes, the actors provide aural effects with their instruments and also engineer a most effective visual effect for the storm on the heath. With the curtain closed across the stage, some of the troupe rattle and pound on two copper sheets at the back of the stage to create thunder while others pull back on the bottom of the curtain and shake it to look like bed sheets on a clothesline whipping in a gale. Marcell is out in front of the curtain playing Lear's raging at the storm, but all the commotion behind the curtain doesn't steal his thunder. Marcell's Lear is determined to out-blast Jove. He speaks Lear's lines in all capital letters in this scene and in some of the king's other scenes, too. This Lear is over-the-top in everything he does—he has a pronounced bounce in his step entering the first scene like a jolly old king, he is rabid when he's angry, and crazy-crazy when he's, um, crazy. He is frail enough that kneeling becomes an adventure for his legs and balance, and he often clutches at his heart as if he were Fred Sanford ready to join Elizabeth. Like that Redd Foxx character on Sanford and Son, Marcell's Lear may be more full of show than real distress, as heart-attack gesturing always works to get his followers to jump to his side in aid. But when he does go over the edge, it's a swan dive off the Dover Cliffs into an otherworld of reality. 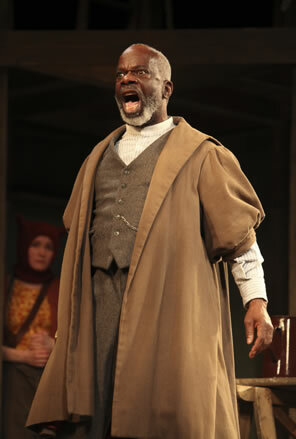 Even when Lear reunites with Cordelia, Marcell acts as though Lear believes he's hallucinating. If Lear's mind already is slipping in the play's first scene, he covers it up in a testosteronic display of pride. What concerns Marcell's Lear most is loss of his virility. "I am ashamed that thou hast power to shake my manhood thus," he shouts at Goneril (Gwendolen Chatfield). "Let not women's weapons, water-drops, stain my man's cheeks!" he says in his supplication to the gods for relief from the tyranny of his two eldest daughters. The mere thought of being old gnaws at him; every time he refers to himself as "old," the word seems to be a dose of cod liver oil he swallows with a grimace. Even when he's raging at the storm, he pauses before begrudgingly acknowledging to the elements that he is "A poor, infirm, weak, and despised old man," forcing himself to cough up the word infirm. "Can you make no use of nothing, nuncle?" the Fool (also played by Cullinane) asks him. "Why, no, boy; nothing can be made out of nothing," the king replies. "Prithee, tell him," the Fool says to Kent, "so much the rent of his land comes to." Marcell's Lear is under the delusion that he is still king and that raising his voice will get people to heed his wishes. Goneril and Regan (Shanaya Rafaat) see him as, at most, a bully who will bluster ceaselessly until you give him hearing. He's a squeaky wheel, and when a bit of greasing him with feigned courtesy doesn't result in smooth proceeding, they let go of the wheel. Both Goneril and Regan beam in pride as Lear bestows Cordelia's portion of his kingdom upon husbands Albany and Cornwall, and immediately the two elder sisters turn to smugness, not only toward Cordelia but also toward each other. Especially Regan: she no longer is merely second daughter (not first like Goneril, not favorite like Cordelia); she now is, in essence, queen of her realm. In her conversation with Goneril at the end of Scene One, Rafaat's Regan curtly answers her older sister as she keeps making motions to depart. Thereafter, the two elder daughters make a concerted effort to un-king their father. "Who am I, sir?" Lear demands of Oswald, Goneril's servant (Daniel Pirrie). "My lady's father," Oswald replies, clearly on guidance from his mistress. Goneril three times refers to her father's dotage, including to his face in countermanding his command: "All's not offence that indiscretion finds and dotage terms so," she says. At Gloucester's house, after the Cornwalls order Kent (Bill Nash), serving the king, into the stocks for his fight with Oswald, Gloucester (John Stahl, who also plays a heroic Albany) argues that such action will be taken as a direct insult by the king. "My sister may receive it much more worse to have her gentleman abused," Regan replies, indicating where she places her father in the royal pecking order. When Lear arrives and, indeed angry about his messenger being put in the stocks, demands to see Regan and Cornwall; but his command becomes Gloucester's "informing" them, and their denial to see the king is "mere fetches." Lear soon presses the issue of Kent being put in the stocks, and Cornwall (Alex Mugnaioni) takes credit with a forcefulness that challenges the king to do something about it. The most Lear can do is claim to be having another heart attack and then storm off into the storm. In telling Gloucester to shut the gates on the departed king, Regan refers to her father and his knights as "The old man and his people." Cordelia's motive in the first scene seems to be no more than maintaining her naïveté. She blithely watches Lear's "who loves me most" pageant unfold without grasping its implications, and in this production, those implications are obvious even before Lear turns on her. The scene starts off as a celebratory gathering of the court until Lear inexorably shifts the proceedings to the love contest, which comes as an unwelcome surprise to everybody (their reaction to his proceedings is the only indication that his behavior might be unusual here). Goneril must think fast before giving her speech. Regan follows by describing how she matches her sister in affection, but as Rafaat seems to end her speech at that point, Marcell's Lear turns away disappointed, prompting Rafaat's Regan to quickly continue, "only she comes too short." Marcell shows us a Lear soaking up these speeches with obvious pleasure, but Cordelia notes it not. This is not Cordelia's nor Cullinane's fault but director Buckhurst's: he's the one who cut her explanatory asides to the audience and has her standing there with a vacant smile on her face. 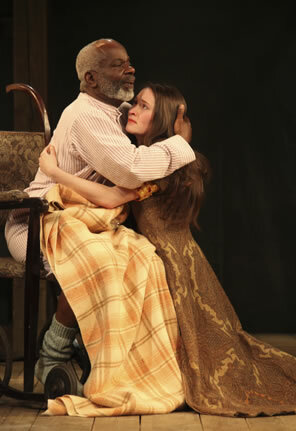 King Lear (Joseph Marcell) reunites with his youngest daughter, Cordelia (Bethan Cullinane), in the Globe on Tour production of King Lear, which opened its North American tour at the Folger Theatre. Photo by Ellie Kurttz, Shakespeare's Globe. This production does provide some enlightening textual interpretations, particularly in the Gloucester subplot. Regan shows infatuation with Edmund (Pirrie) upon first meeting him, a comic bit even as Cornwall notices. Oswald is a frightened fop, and rather than fighting Edgar (Mugnaioni) over the blind Gloucester, he focuses only on trying to kill Gloucester, who spreads his hands in patient anticipation of being slain; Oswald is geniunely shocked that the peasant—Edgar in disguise—would become something more than an annoying obstacle and actually disarm and kill him. In a clever piece of stage business, after the battle against Cordelia's invading French army, Goneril offers tankards of wine to Edmund and to Albany, who refuses his, so she hands it to Regan, who drinks; thus the poison Goneril intended for her husband ends up in her sister. No stage direction indicates such a sequence, but the text provides a valid license, and I'm surprised I've never seen it played this way before. The Globe's touring Hamlet clearly played as professional touring actors using their experienced wiles to transition from character to character and to stage a scene as complicated as the Mousetrap (the memory of that scene flickers through my mind like a fond video I like to call up and watch again and again). This King Lear, however, plays more like the rural village's own amateur theater society putting on the play for the annual church fete. This is not to denigrate the actors' skills—the verse speaking is noticeably good, and most of the players exhibit a keenness in their character interpretations—but aside from the overly demonstrative presentations of Lear and the Fool, this cast engages a winking admission that they can only do so much with an eight-actor troupe. Playing both Edmund and Oswald, Pirrie, in the one scene featuring the two characters on stage at the same time, at first attempts to transition from character to character from one side of the stage to the other, but quickly gives up the ruse. So, was this whole production a ruse? Players playing players playing a play rather than the play itself? That makes for an entertaining intellectual exercise, but it does not meet my personal measure of what makes a successful King Lear—the audience's uncontrollable need to cry when Lear enters howling and carrying the lifeless Cordelia as we feel both anguish for the victims on stage and our own deep sense of unnecessary nihilism. Instead, as Marcell clutched at his heart yet again while kneeling with the dead Cordelia, I couldn't help thinking of all the previous Sanford and daughter moments we'd already witnessed in this King Lear.